If you didn’t see the news on my Facebook page, we welcomed our sweet baby girl into the world this past weekend! She is perfect in every way and we are enjoying all the newborn baby snuggles. Of course I had to bring a crocheted hat for her to wear while in the hospital so I came up with this knot hat pattern and added a little crochet heart as an embellishment. At birth she weighed 8lbs 1oz and is 21 inches long with a 14″ head circumference. 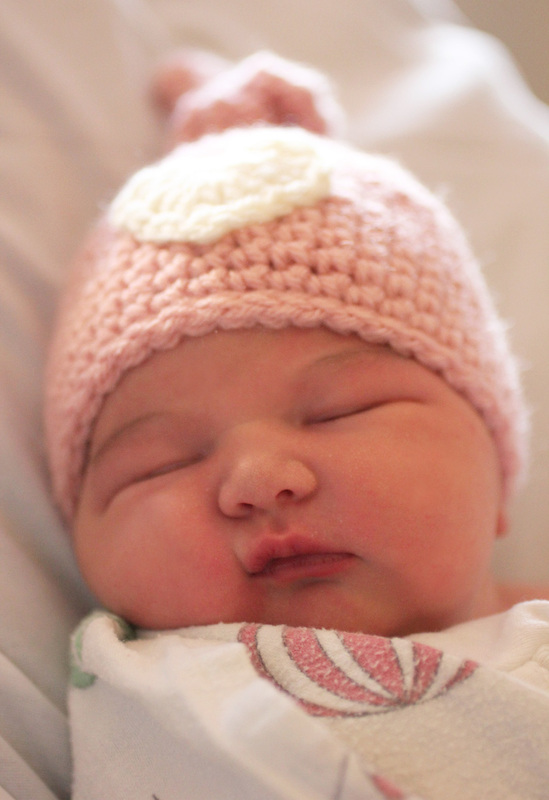 This newborn hat just barely fit her without much room to spare. So use a larger hook if you think your newborn will be larger than her stats. You will now join your rounds. Optional: slip stitch in each stitch around. Tie knot in the top of the hat. I followed THIS pattern by Skip To My Lou but stopped after Round 1. Leave a long tail and sew heart onto front of hat with tapestry needle. What a beautiful baby, congratulations!! Love this hat too, can't wait to try the pattern. Congrats!! Enjoy her while she's little they grow way to fast! 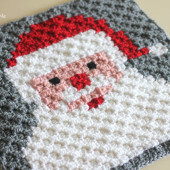 Congratulations & thank you for the adorable pattern! Gorgeous baby and hat !!! Congratulations! what a sweet little babygirl….good luick to all of the family! I love it ! I also love how you keep me inspired……. congratulations. Congratulations!! She is adorable and I wanted to write earlier to tell you, but your patterns are by far the best and easiest I've ever made. Congratulations on that sweet angel! She is beautiful and the hat pattern is perfect! I think there might be a little mistake in the round 20-24 (but i think is 21-24). How can I repeat "2 SC in first stitch, SC in next three stitches, repeat around (10 SC)" 3 times, and still have 10 sc??? 🙁 I think I am lost. I'm working on this pattern right now, and think I can help with your confusion. Round 21 you'll do the 2sc in first stitch, sc in next 3 stitches, repeat around (10sc). Then for rounds 22-24 you'll sc in each stitch (10sc). It's basically the same directions as round 17, and then 18-20 but doing 10sc instead of 8sc. I did the same thing as Samantha, and it turned out great! I'm wondering how to make the heart appliqué and NOT have a huge hole in the center. Any suggestions?? I start all my hats the same way that the heart is started, and I make sure that I pull the tail as tight as possible to close that hole. I also weave my tail in the the same direction I had to pull to close the hole. So instead of weaving the tail in the stitches that are in front of where it comes out of(over the slip knot), I weave it into the stitches behind where it came out of…. I hope that makes sense. Sorry for the mistake! Yes, Samantha is correct and I believe I have it fixed now. That's what I get for writing down the pattern while still in the hospital. And to create the heart appliqué without the hole, start with a magic ring and pull tight to close. Congrats Sarah with your beautiful daughter/model. That's very cute & looks so sweet! What a sweet heart! Congratulations on such a beautiful baby girl! So gorgeous your beautiful little girl with a gorgeous warm hat. Congratulations! With this pattern you make a lot of other mums also happy. Thanks! She is absolutely adorable – a real little girl (bet you are going to have tons of fun dressing her up in all the lovely things you make). Enjoy every minute – the hat is quite adorable too by the way! She's beautiful!! Congratulations to your whole family. 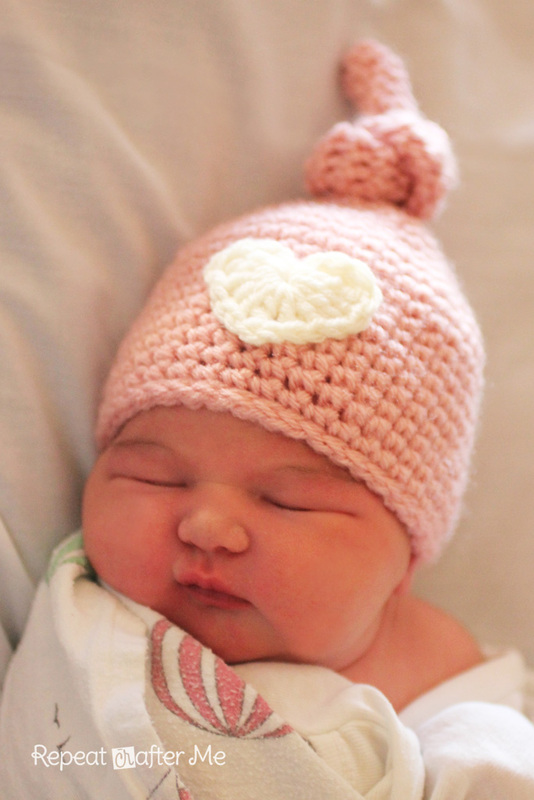 Oh she is just lovely Many many congratulations, and she looks perfect in that adorable hat! congratulations! boys are great, but girls are so fun to dress up! beautiful baby and I love the hat! What an adorable hat and an even cuter baby! Congrats! Thanks for the pattern. I just made one in aqua and it is adorable:) Congratulations on the little peanut, she is a cutie! 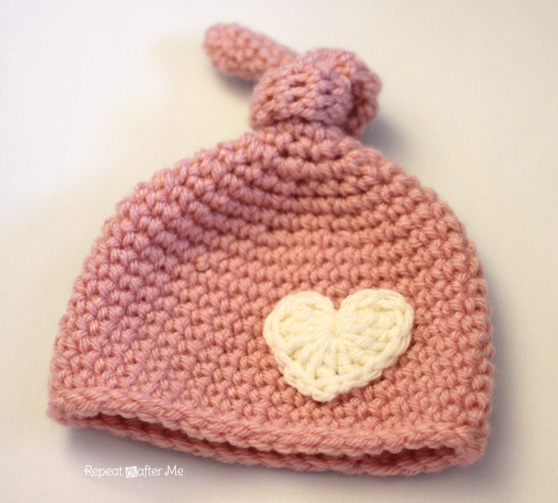 Congratulations Sarah with your beautiful baby-girl!She looks so sweet and adorable…enjoy!They're growen up before you know,ha,ha….The little hat is so cute either I'm gonna make one for an little baby-girl who will be born in about 16 weeks,love this one with the knot! Your patterns are so easy to follow, I just wanted to let you know. I made two of of these adorable hats for a friend who's havign a baby sometime in the next four weeks. They turned out super adorable (just like your adorable little girl 🙂 ) THank you so much for your free patterns. I'm using them like crazy for friends. Congratulations from Germany. She´s perfect. Sarah, thanks for sharing this awsome pattern!! I'm 35 week pregnant and I've made this knot hat for my baby girl. Thanks so much for the pattern. I am trying to make this hat now. In the beginning row after making the magic ring and 3 sc do we join the round? How do we make two sc in each stitch unless we turn the work or join the round? Thank you for all the wonderful patterns! I made the owl hat and am now trying to make this beautiful knot hat for my niece. I'm also having a hard time with the instructions. I'm new to the magic ring and I think I got the hang of it, but I'm so confused where it says don't join. I've tried looking up tutorials, but I still can't figure it out. What a beautiful baby! 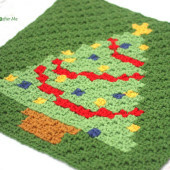 Thank you for posting the pattern! 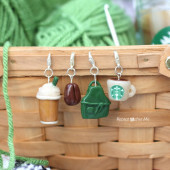 Your amazing and I wish I could crochet even one thing without messing it up :'( maybe this will be it! Do you join to the first SC or CH1 when you join? is there a visual Tutorial? 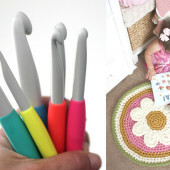 Hi I am new to crocheting, I live in Australia, what size ply wool/yarn do i need and wht size hook. be greatful for any and all help 🙂 cheers Leigh. I love this cute hat! To make a bigger sized hat, should I just add more increasing rows? hi what do u mean .. now you join in the rounds ? ?